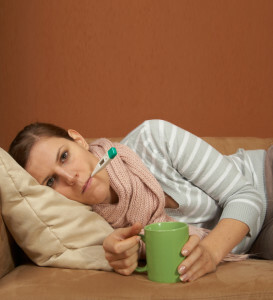 Have you gotten sick after traveling abroad to areas like Latin America, Southeast Asia, or the Pacific Islands? If you were stung by a mosquito, there is a possibility that you could have been infected with dengue virus. Dengue infection can be complicated but early recognition and treatments can lower the risks, such as medical complications or death. Diagnostic Automation / Cortez Diagnostics, Inc., offers quality dengue ELISA tests for your needs. Typical dengue symptoms are usually high fever, joint pain, bone pain, and rashes. It’s important to watch for any warning signs and go to the emergency room if you are having severe stomach pains, vomiting, red spots, or difficulty breathing. Typically, there have been very few cases in the US, but there was an outbreak in 2001 in Hawaii. When traveling, it’s important to use bug spray and other pest control methods to avoid being bitten. No one wants to travel with this troublesome disease! Take a look at our dengue ELISA tests and make your purchase today. Whether you are an individual who suspects a problem or are working for a testing lab and need to run this test, Diagnostic Automation / Cortez Diagnostics, Inc., offers excellent tests for your needs. 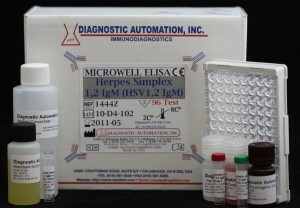 Herpes Simplex 1,2 IgM (HSV-1-2 IgM) ELISA kit – This kit is intended for the detection of IgM antibodies to HSV 1 and 2. It is known to have high sensitivity and specificity. Herpes Simplex 1,2 IgG (HSV-1-2 IgG) ELISA kit – We have developed this kit to evaluate a patient’s serologic status to an HSV infection or paired sera for the presence of a significant increase in herpes specific IgG. Herpes Simplex 2 IgA (HSV-2 IgA) ELISA kit – When you need to detect the IgA antibodies of HSV 2, this kit will work for you. Check out our selection and choose the kit that fits your needs. Additional herpes kits are available. The team at Diagnostic Automation / Cortez Diagnostics, Inc., work hard to make sure we provide you with the best and most affordable ELISA kits on the market. Summer is the season for Salmonella. Whether people are eating at weird places, just not properly handling food, or playing with animals, it’s very possible that you can get Salmonella food poisoning. Children are more likely to get Salmonella, but older adults and people who have issues with their immune systems can get it as well. 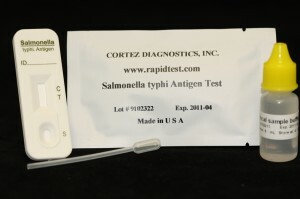 You can know if you or your patients are suffering from this disease using Salmonella rapid tests from Diagnostic Automation / Cortez Diagnostics, Inc.
Salmonella is caused by Salmonella typhi bacterium and spread by variety ofways, but most people usually get it by eating contaminated food. Food can be contaminated by someone who has not washed their hands and has the disease. Salmonella is also found in the feces of pets, as well as on reptiles, small rodents, and ducks. It’s important to make sure that you and your family wash your hands at all times after touching any strange animals, after cleaning up after your pets, or before handling food. Most people who have Salmonella get stomach cramps, a fever, and diarrhea, which can cause intense dehydration. Generally, this disease is treated by managing the symptoms until everything passes. Once you have taken one of our rapid tests, the doctors will know exactly what problems you have and will be able to properly treat you. Are you attempting to have a child and interested in making sure your body is prepared? Are you running a fertility clinic and looking for simple tests to highlight what methods you need to take for your patients? Diagnostic Automation / Cortez Diagnostics, Inc., provides quality fertility ELISA tests that can give you the knowledge you need to make the miracle of child birth a reality. hCG ELISA Kit – Our Human chorionic gonadotropin (hCG), determines Total beta-hCG concentration in human serum. 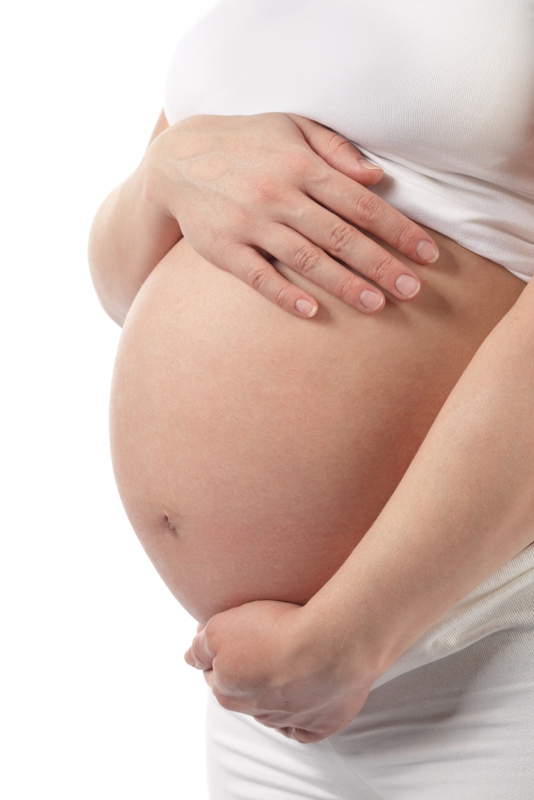 hCG is produced during pregnancy and a simple test can determine pregnancy in women. LH ELISA Kit – Our LH kit tests for luteinizing hormone, which let you, know about your peak fertility times. An LH surge in your body is a reliable marker of ovulation. Using this test will let you know when you should start the conceiving process. FSH ELISA Kit – This kit tests for follicle-stimulating hormones, a glycoprotein produced by the pituitary gland. In women, FSH helps manage a women’s cycle and stimulates the ovaries to produce eggs. Our FSH test can be used to help diagnose Menopause, ovarian cysts or problems of infertility. Human Growth Hormone (HGH) ELISA Kit – This test is designed to quantify levels of human growth hormone in serum. Growth hormone regulates cell growth, cell reproduction and growth in children and adolescents. Take a look at our selection of fertility ELISA kits today and find the right selections for your needs.